Yesterday was World Poetry Day so we thought it was timely to acknowledge the real potential that poetry has to create social change. Today we are featuring some inspirational poets – some well known and others new and emerging. Alice Walker is one of my favourite poets and authors. I have this poem, Torture, above my writing desk at home. Maya Angelou is another of my very favourites and her poem, Still I Rise, is one of her most famous. With a more local flavour, poet Ciaran MacLennan has written a moving series of poems about asylum seekers, By Sea They Come, published in Meanjin in 2012. Oodgeroo Noonuccal wrote many beautiful stories and poems that have been celebrated around the world. I particularly love ‘All One Race’ and ’An Appeal’. And of course Dorothy Porter, arguably one of Australia’s most influential poets has a large selection of wonderful verse. In particular I love ‘Trouble‘ and ‘Bullets and Knives’. We would love to hear about your favourite poems that inspire change so pop along to our Facebook page and add your ideas to our discussion. And if you were lucky (and clever) enough to get a free cup of coffee yesterday, in exchange for a poem, let us know – and share your poem! 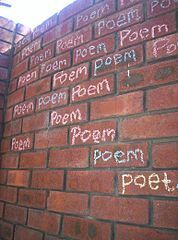 Happy World Poetry Day (for yesterday!! ).